Fruit Of The Loom ringer crew neck t-shirts with coloured neck and arm trim. 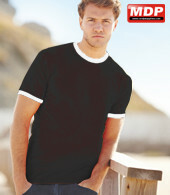 Cotton/Lycra® rib. 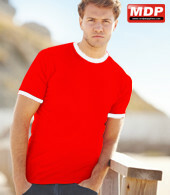 100% cotton Belcoro® yarn. White 160gm, colours 165gm. 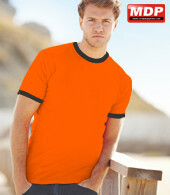 Pack pricing for Ringer T-Shirts is for 12 garments in the same colour and size.